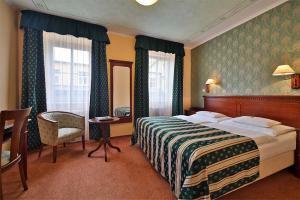 The Best Western Plus Hotel Meteor Plaza is ideally located in the Prague's historic center, just steps from Old Town Square and at the start of the Royal Road to Prague Castle. The hotel offers a host of amenities to ensure an enjoyable stay, including a complimentary breakfast buffet, free Wi-Fi, meeting facilities and well-appointed guest rooms. The spacious rooms feature satellite TVs, coffeemakers and minibars. After a busy day of sightseeing, guests can wind down at the fitness room or in the whirlpool and sauna. The hotel also offers a full-service wine bar and restaurant in an original 14th-century cellar. Vaclav Havel Airport is approximately 10 miles from the hotel.